In the past few weeks, my daily reading has been guided by what I call my "triple standard" (the term just popped into my head). This is a resolution to read a bit of Irish language material, a bit of poetry (especially long poetry), and a bit of Scripture every day. It's actually not that hard and I've usually fulfilled this aspiration by noon. So, in these three literary pursuits, it's "going against the tide" more than anything else that motivates me. Catholics are notorious for their reluctance to read the Bible. As is well know, it was a sin punishable by excommunication for a layman to even open the Bible until the Second Vatican Council. The reluctance has lingered. Whereas Baptists and Presbyterians can rattle off chapter and verse from Scripture, Catholics prefer to read Thomas Merton or G.K. Chesterton. OK, that's an exaggeration, but there's an element of truth to it. The Bible is a difficult book to read. It's repetitive, laden with genealogies and lists of rules, and dense. This is especially true of the Old Testament, and it's mostly the Old Testament I struggle with. I'm fairly familiar with the New Testament, but there are whole tracts of the Old Testament which are more or less terra incognita to me. And yet, this very denseness and difficulty is part of the appeal. The Bible has always captured my imagination, even when I was non-believer. A line from the Bible seems more potent than any amount of words from most other sources. I recently mentioned my trip to Kingston-upon-Hull in Yorkshire, some ten years ago. I visited an enormous aquarium, which contained a bewildering variety of marine life. And yet the thing that struck me most were the words over the entrance: "And the spirit of the Lord moved over the waters." Even at the time, this struck me as extraordinary. When I used the word "potent" earlier, the association with liquor was entirely appropriate. I think of Scripture as fire water. In fact, I think the same of poetry. Here's another example of the potency of Scripture: many years ago, I was watching the classic horror film From Beyond the Grave, with my father. One scene, set in a bedroom, shows the framed text: "The wages of sin are death". "But the gift of God is eternal life" said my father. I was impressed at the way the Scriptural quotation gave the scene such gravitas. And it works the other way, too: when I read the Bible, or hear it read, the fact that so many lines and passages are familiar from quotation and allusion gives it an added power, as though it is the cradle of our entire culture. Another thing that impels me towards the Bible is a sadness and shame at the loss of Scriptural knowledge in our culture. You only have to read a little to notice this. In fact, I think the decline is ongoing. I remember reading this joke in a recently-published kid's joke book when I was a boy: "Jenkins, who knocked down the walls of Jericho?" "I don't know, sir, but it wasn't me". I suppose I can say that I want to read more Scripture to push against secularisation, I want to read more Irish to push against globalisation, and I want to read more poetry to push against rationalisation. Of my "personal traditions", poetry is older than everything except horror. I've been an evangelical poetry lover since my teens, and I've resented the tyranny of prose for much of that time. As I return to reading poetry in a disciplined way, this old feeling revives. We should always be somewhat ashamed of prose. Poetry is literature; prose is good enough for instruction and entertainment. Honestly, is a novel much better than a game show as a form of diversion? What annoys me especially is novels (especially detective and thriller novels) that take their titles from poems. That kind of putting on airs is odious. Admittedly I'm being provocative here, but that doesn't mean I'm kidding. And I could expand my argument to a more general level. My whole traditionalist conservative outlook is really nothing more than the desire to make society less prosaic and more poetic. As for the Irish language, I wrote a lot about that last year. I want to be able to say legitimately that Irish is a part of my daily life. Every now and again, I feel such a wave of indignation at its decline that I feel like refusing to ever use English again. I realise even as I feel it that I will do no such thing. 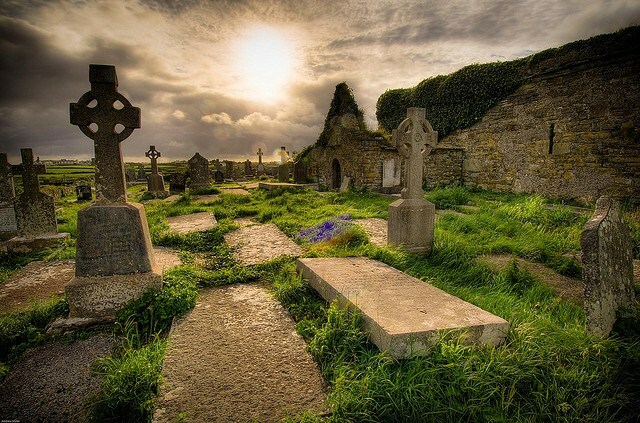 Irish is one of those causes that can't be given up, no matter how impossible its revival seems. Perhaps the tide of history will change some day. In any case, my triple standard gives me a pleasant feeling of pushing against the tide, on three fronts, every day. On this blog, and in my writing in general, and indeed in my life in general, I keep coming back to one particular theme, from many various angles. It's not my only theme but it's a pretty prominent one, and it runs through all the others. Out of one thousand, six hundred and twelve posts on this blog, the one that means the most to me (other than my poem to Michelle) is this one, A Short History of my Priggishness. In that post, I expressed something that has haunted me for as long as I can remember; a life-long craving for the solemn, the elevated, the refined, the special, the poetic. Not just in my life, but in the life of society in general. I'm going to use the phrase "solemnity" even though it's not exactly what I mean. It's only part of it. Another post where I touched on the same theme was this verse-essay, In Praise of Solemnity, which got quite a good response. This craving for solemnity is one of the reasons I'm a cultural nationalist, and a romantic nationalist. I elaborate on that in this post. This craving for solemnity makes me bonkers for tradition, since even fun traditions are satisfyingly solemn. I've written at great length about my love of tradition on this blog, but especially in this series: here, here, here, here, here, here, and here. Since, in our post-modernist society, solemnity is often dismissed as "kitsch", and tack is often celebrated as ironic, I wrote a blog post on kitsch and tack, defending the former and blasting the latter. My little purple notebook is full of moments where I glimpsed the kind of world, or the kind of atmosphere, I crave. My post on the phrase "the dark side of the moon", and everything this evokes for me, explores the same territory. The post I recently wrote about my teenage hankering for the fantasy city of Amber is, perhaps, my latest expression of this theme. I'm sure there are many more I've missed, though. A friend once asked me how, given my love of solemnity, I'm not a devotee of the Latin Mass. I've puzzled over this, and come up with the answer: Mass is already the most solemn thing in modern life, even if it's the Ordinary Form. It's the most solemn thing by far. I don't need Mass to be any more solemn. That would be bringing coals to Newcastle (or sand to the beach, as Americans say). I need the rest of life to be more solemn. This theme has been on my mind recently, as I've been reading long poetry-- Idylls of the King by Tennyson and Night Thoughts by Dr. Edward Young. When I read poetry, it makes prose seem so flaccid to me. I become somewhat disdainful, not only of prose, but of everything prosaic. I want all writing to strive towards poetry, and all life to strive towards the poetic. The existence of Terry Pratchett novels, hen parties, and TV shows like Top Gear seems almost unbearable. This craving for solemnity isn't just directed towards the outside world, though. I yearn to embody this in myself, and indeed I do try. What value has all this? I'm not sure. This craving leads me towards the sacred, so it seems valuable in that regard. Whether the more aesthetic aspect has any value is not something I can really argue impartially. I'd like to think it does. In any case, this craving is so deeply-rooted in me, I imagine it's impossible to quench, even if I wanted to. Well, I've achieved a personal goal in finally finishing Lord Alfred Tennyson's Idylls of the King, a long poem I've intended to read for many, many years. I embarked on it several times in the past but never saw it through. I've read a lot about the poem, as well-- there is quite a wealth of critical writing devoted to it. This pleases me, as I love commentary of every kind. I wrote a "report" on it for the "Whatcha Reading?" thread on the Irish Conservatives Forum, and I give a slightly amended version of that here. From at least my early teens Tennyson has been one of my favourite poets. I've always loved "Ulysses", "The Chorus of the Lotos Eaters", "Locksley Hall", and (most relevant here) "The Passing of Arthur". "The Passing of Arthur" is a blank verse account of King Arthur's end which Tennyson wrote quite early in his career. Over many years, he added other stories to this to make Idylls of the King, which is a series of twelve narrative poems, set against the background of King Arthur's foundation of Camelot and its subsequent decline. Each of the Idylls tells a different story, and there is a narrative thread through them all, but it's not written as one continuous tale. The basic narrative thread is this: King Arthur, with the help of Merlin, founds the order of the Round Table and the city of Camelot in order to bring peace to a chaotic Britain, which is torn between the Roman legions (which he finally expels) and pagan tribes. The Idylls describes the Round Table's foundation, flourishing, and ultimate decline and dissolution. It's hard to believe that the Idylls were an enormous success at the time of their publication (they were published over a period of years). It seems like nobody reads this kind of long poetry now, other than academics. I must confess I made several efforts in the past to read them and gave up. I'm glad I persisted. The story is a very dark one. It's much more concerned with the fall of Camelot than with its splendour. As most people will know, Arthur's queen Guinevere commits adultery with his foremost knight, Lancelot. This original act of disloyalty spreads moral contagion through Camelot, and one by one almost all the characters are corrupted in one way or another. The actual delineation of this corruption is very subtle. Here is one example. In one of the later idylls, "The Holy Grail", many of the knights of Camelot take a vow to seek the Grail, the vessel used by Christ at the Last Supper, which a nun has seen in a vision. But this, too, is a symptom of degeneration, since King Arthur (who is absent when these vows are made) berates his knights for seeking spiritual excitement rather than following the knightly vows they had already taken. And, indeed, the Grail Quest is a terrible failure-- only a third of the knights return, and most of them never see the Grail. Throughout the Idylls, King Arthur is blamed by various characters for demanding ideals which are too lofty, and which are even described as impossible to fulfill. Indeed, Arthur himself wonders at times if this is the case. Guinevere tells Lancelot that she falls in love with him, rather than the King, because Arthur is almost inhuman in his idealism; "For who loves me must have a touch of earth". It's interesting that the Idylls were written at the height of the Victorian era, since Victorian England has often been lambasted for its hypocrisy and double standards. This is a debate that seems to recur throughout history, in many different contexts: should we adopt exalted standards which are difficult to attain, and run the risk of hypocrisy, or should we be more realistic? As a romantic I am more on the side of King Arthur than his critics. The poem dramatises the backlash against idealism when one of the Round Table's most idealistic knights, Pelleas, becomes so horrified at the corruption within Camelot that he embraces nihilism. He reinvents himself as the Red Knight and creates an anti-Camelot whose vows are all the opposite of Camelot, and declares war on King Arthur. This is reminiscent of Kevin O'Higgins, a very hardheaded Irish politician of the post-independence period, who insisted that the idealistic programme of the first Dáil was "mostly poetry." In fact, it's reminiscent of the Irish people's attitude to the Irish Revival in general. The unspoken view common amongst the Irish people seems to be that cultural nationalism and Gaelic romanticism was appropriate to the struggle for independence-- "the wholesome madness of an hour"-- but is no longer relevant today, now that we have our own government. I just can't accept that. If Ireland doesn't continue to seek the ideal of Patrick Pearse and Eamon De Valera-- by which I mean a Gaelic, Catholic Ireland, reverencing and reviving its traditions as far as possible-- I don't know what the point of independence was in the first place. Does it seem silly to apply the poem to twentieth century Irish history, since it was written in the nineteenth century? Just like Tolkien with Lord of the Rings, Tennyson insisted that Idylls was not a straightforward allegory. When asked if critics were right who interpreted the "three fair queens" who appear in one passage as the theological virtues of Faith, Hope and Charity, he said: "They are right, and they are not right. They mean that and they do not. They are three of the noblest of women. They are also those three Graces, but they are much more. I hate to be tied down to say: 'This means that', because the thought within the image is much more than any interpretation." I'm very pleased that I've finally read the Idylls-- but I don't intend to simply put them on the shelf now. No, I hope to revisit them in the future, and to get to know them better over time. The priest in UCD gave a good homily at Mass today. The gospel reading was from St. Luke, "People were eating and drinking, marrying wives and husbands, right up to the day Noah came into the ark, and the flood came and destroyed them all." He said that we were always in danger of losing sight of the Christian mission, which was "simple, but challenging in its simplicity." This is the paradox that strikes me again and again when I read the lives of the saints. They were men and women who were focused on Jesus all the time. It sounds so simple. I'm trying to write this blog post in a way that doesn't resort to platitudes, and I've been hesitating over my words. I mean something very specific here. Everyone would agree that Christians should always be focused on Jesus, but "keep your eye on the ball" is rather trite. I'm trying to convey a particular aspect of this general truth, I suppose. Here is the best way I can think of putting it: the fall from Christianity, whether in individuals or in societies, always seems to begin by Christianity being pushed in the background and something else taking the foreground. I suppose the example we're all most familiar with is the religious order that becomes so besotted with "social justice", it eventually ceases to be Christian in any meaningful sense. But this is a peril for conservatives as well as liberals. Conservatives are in danger of making an idol of nationalism or some other conservative cause. I've noticed, myself, that when I'm reading about some (dead) person who was a Catholic, my question is always: "How much did their Catholicism matter to them?". Did they go to Mass? How often? Did they read the Bible? Did they often write or speak about the Faith? Was their Catholicism part of their daily life or something in the background?" Now, I'm very well aware that someone could go to daily Mass, spend all their time participating in Catholic organisations, read five Catholic papers a week, and still be a terrible Catholic. I'm always haunted by the fear that God will tell me: "I never knew you" on the Day of Judgement. But the opposite doesn't seem to be true. I've never heard of a saint or a great Christian for whom Jesus was simply something in the background. It always seems to be the case that Jesus is not only their motivation, but their daily and constant preoccupation. I'm always struck that, when Jesus speaks about the seed that fell on thorny grounds in the parable of the sowers, he says: "The seed which fell among the thorns, these are the ones who have heard, and as they go on their way they are choked with worries and riches and pleasures of this life, and bring no fruit to maturity." That is, he emphasises the pleasures of life even more than its trials. And this rings true for me. I know from my own experience that enjoyment, giddiness and good humour are even more likely than adversity to drive the thought of Jesus from my mind. Readers of this blog would probably be shocked if they knew just how bitchy, uncharitable and indecent I can be when I'm kidding around. It's one of my besetting temptations. When I get into a giddy mood, or into the right company, I find it very hard to restrain myself (though I'm getting better at it, I think). I understand why Ecclesiastes says it is better to go into the house of mourning than the house of feasting. Or why Newman preached this sermon. If St. Elizabeth of the Trinity had to go to a party, before she entered the convent, she would spend several hours of prayer in preparation for it. That makes a lot of sense to me. It's not just giddiness, though. It's intellectual and cultural interests, as well. Ever since I became a Christian, I realise that there have been many times when my faith was in the background, and some other preoccupation was in the foreground. Despite my daily rosary and my near-daily Mass attendance, this happens. These things are always in danger of becoming mechanical. Most of us have to live in the world, so how do we address this problem? The approach I'm taking is to try to keep Jesus in the foreground every day. I know that keeping Jesus in the foreground every single moment should be the ideal, but if I can manage every day, I think that will be great progress. One way I'm trying to do this is to read the Bible for some non-trivial amount of time every day, but I'm also trying to do it by writing reminders to myself to read regularly. I'm hoping this will help. But I know this will remain a struggle, and no routine can replace that struggle. A Beautiful Passage from Tennyson's "Idylls of the King"
The poem is divided into twelve 'Idylls", each containing a separate story. I'm currently reading "The Holy Grail", which describes the quest by many of the knights of Camelot to find the Holy Grail. The sister of one knight, who is a nun, has had a vision of it. When King Arthur learns that many of his knights (in his absence) took vows to search for the Grail, he is horrified-- he tells them that this is not their mission, that they should have stuck to their own mission as knights of Camelot, and that the quest belongs to Sir Galahad and Sir Perceval alone-- both of whom were granted visions of the Grail. That's all incidental. In his quest for the Grail, Sir Percivale speaks to a holy monk Ambrosius, whose evocation of his simple, local life is very moving. He is somewhat sceptical of the Grail Quest, since he has found no mention of it in his holy books. His participation in the life of the community contrasts with Percivale's experience; ever since embarking on the Quest, he has seen no people, only phantoms. "That have no meaning half a league away"! Isn't that amazing? Readers are always welcome to ask for prayers from me and from other readers of the blog, whenever they so wish. Mail me your intentions and I will blog them, keeping them anonymous if you'd prefer. I'm very grateful for all the times readers have answered my prayer requests. It shouldn't be a one-way street! I've never really been much of a novel reader, but one novel which greatly appealed to me in my teens was Nine Princes in Amber by Roger Zelazny. It's a fantasy novel, and the Amber of the title is a city which is the only "true" place in existence. Every other world, including out own, is a reflection of some aspect of Amber. The idea of Amber was wildly exciting to me. For one thing, I absolutely love the word "Amber". When I had a secret society with my brother and cousins, (we existed for the purpose of being a secret society), my code-name was Amber. It's one of my favourite names, and one of my favourite words. But the idea of Zelazny's Amber thrills me, too, and this is what this blog post is about. All my life I've been beguiled by the idea of a world, or a state of being, where life is elevated. I don't know what better word to use than "elevated", because this yearning is very specific and not be confused with other yearnings. It's not a yearning for a utopia, because it doesn't seek to escape from evil and struggle. If I use words like "humdrum" and "quotidian", that also gives the wrong impression, because this yearning is not a yearning to escape from the ordinary. In fact, I've always loved the ordinary with all my heart. Banal is a better word than 'ordinary' here. The ordinary can contain the sublime, but the banal never does. Perhaps Nietzsche's concept of eternal recurrence is the best way to approach it. Nietzsche said the ultimate affirmation of life would be to yearn for our lives to be repeated eternally. As a Christian, I obviously don't subscribe to that, but I do (involuntarily) apply the criterion of "eternal recurrence" to each moment. I think; could this moment be frozen timelessly in a picture, or a poem? Is there something eternal within it? Now, obviously that can be a moment that is very ordinary, or one that is very special. It can be a kiss or standing at a bus stop on a cold day. I've mentioned my fascination with photographs, especially enigmatic photographs...I constantly imagine I'm in a photograph when I am out and about. A photograph that is several decades old. There are moments, however, that seem altogether devoid of this potential to be eternal. Bitching about one acquaintance to another, for instance. Small talk. Sarcasm. Channel-hopping. Lingering in a museum gift shop. Reading trashy magazines. That sort of thing. They cast their eye down into the fountain: and now glanceth up to me their odious smile out of the fountain. Of course, Nietzsche expressed this concept in typically aristocratic terms, and in my anti-populist youth I would have agreed with him enthusiastically. But even now, I sympathize with these words, although with the understanding that "the rabble" is me....the rabble is all of us, all too often. Whenever we cheapen or banalize or coarsen life, we are the rabble. But back to Amber. The thing I liked most about Amber was that Corwin only remembers it gradually. When someone first mentions the name to him (it's his sister, who doesn't realize he has lost his memory), it fills his soul with an unspeakable yearning and he doesn't know why. Slowly, he begins to remember it as the story goes on. This is similar to my own yearnings for an "elevated" world. There's something inescapably indirect about such yearning. When I look at my reflection in a Christmas bauble, and see myself and the room around me transfigured into something else, I seem to see Amber. When I see out a back window through a front window, I seem to see Amber. When I look at the frozen figures in a snow globe, I seem to see Amber. I've often quoted a line I love from the poem "The Burning of the Leaves" by Laurence Binyon-- "The fingers of fire are making corruption clean". This yearning is a yearning for such a refining fire, in oneself and the world around. I want to make clear that this isn't really a matter of morality. I'm not talking about the fires of Purgatory, and Amber is not Heaven. I'm talking about an attitude to this world. Translated into social and cultural terms, this is a yearning for tradition, ceremony, ritual, solemnity, and splendour. For monarchy, cultural nationalism, hierarchy, chivalry, festival, national and regional identity, venerable institutions, public monuments, the preservation of rural life, and so forth. It's what makes me wince when I see tacky advertising, or casinos, or trendy overpriced restaurants, or zany humour. I yearn for Amber in cultural terms, too. 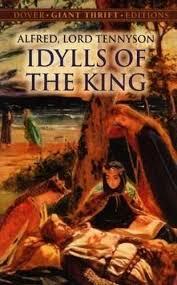 As I've mentioned, I've been reading The Idylls of the King recently-- reading it, and reading about it. Whenever I read poetry, I feel a contempt for prose and for the primacy of prose. I get to thinking that we should read all prose as bashfully and apologetically as we read murder mystery novels. I feel ashamed of myself for reading so much prose. I suppose my yearning for Amber is a yearning for a life that is poetry rather than prose-- and not just any poetry, but heroic verse like Idylls of the King. Of course, we can never live in Amber. But we can try to get closer to it, to breathe its air. Marc, I only saw your comments on some earlier blog posts this morning. Thanks for those, and for your kind words. I can't believe the Googie post got so many comments...it might be the most commented-upon post on this blog! I really do appreciate people taking the time to comment and, if I ever fail to respond, it's only ever an oversight. You say, "I believe in Jesus Christ, the Alpha and Omega, the same yesterday, today and forever." NO you don't. That's the biblical Christ. YOU, sir, believe in "another jesus and another gospel" per 2 Cor 11:4, because the REAL Christ is not anymore in your piece of wafer thin bread as there is a man in the moon. I challenge you to a debate on this very website on that very topic. But is it not true that you are a coward and will refuse the offer, coming up with some reason like, "I don't like your attitude?". Either PUT UP your evidence for Transubstantiation, or kindly SHUT UP. I can't help feeling a certain fondness towards people who write this kind of thing! 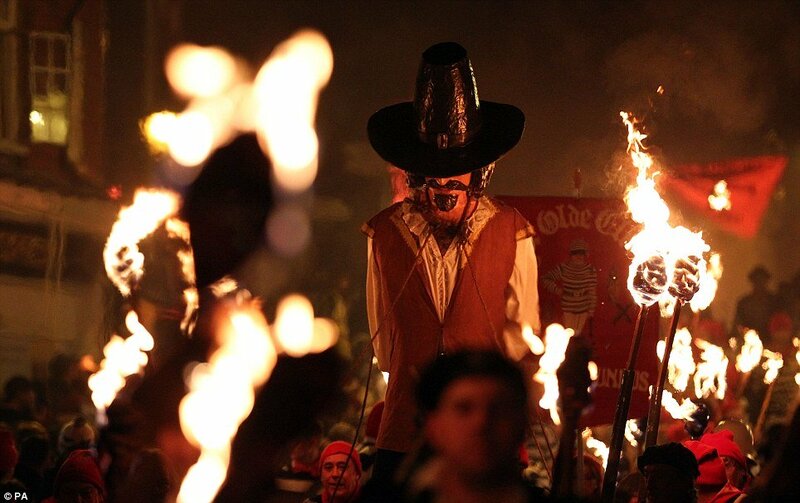 Every year, I'm saddened that Guy Fawkes Day (or Guy Fawkes Night, or Bonfire Night) has become so invisible. Regular readers of this blog will know my feelings about tradition. Short version: I'm keen on it. Guy Fawkes Day commemorates the Gundpowder Plot of fifth November, a plot by Guy Fawkes and other English Catholic to blow up Parliament and thus assassinate King James I, and install a Catholic monarch instead. But the plot was detected, the plotters were executed, and Guy Fawkes Night became a celebration of the Protestant supremacy and foiling of Popish plots. So, it had an anti-Catholic element. Big deal. I remember, when I was a kid, the British comics (which were the comics I got, since there weren't any Irish comics) used to print "Guy Fawkes masks" over centrefold pages, at this time of year-- the idea being that you would cut them out and put them on a cardboard base. Today, there seems to be no mention of Guy Fawkes Day-- neither on the mainstream media, nor on social media. I find it very sad. Why should any traditions be forgot? It makes you sad. Anyway, happy Guy Fawkes Day! As day turns into night, and night turns into day. Let me be here still, leaning on your breast. Give me this peaceful joy that is the best. Before the tabernacle, with you here. Peace in your silent call, your gentle call. Lord, dwell in the tabernacle of my heart. Regular readers will recall my little purple notebook. Perhaps they are tired of hearing about it. Or perhaps not.... I recently had a very deep and emotional discussion with a good friend, one which, along with other things, inspired him with the idea of writing a short book on the meaning of life. As we spoke about this over the phone, I quickly realized that the heart of the book would consist of moments such as those chronicled in my purple notebook-- or (to put it another way), experiences of "joy" as described by C.S. Lewis in Surprised by Joy, or "spots of time" as described by Wordsworth in The Prelude. In fact, my friend was delighted that I'd heard about Wordsworth's "spots of time". So perhaps such experiences are not so unusual, and perhaps this subject is of some interest to my readers after all. I am putting together a new "edition" of my purple notebook. My purple notebook was originally a computer file which I wrote up when I was sixteen or seventeen. I called it the Ancaneron (a name I'll explain in a moment). In my college years, I transferred it to a hard-covered notebook with a marble effect cover, and wrote it out in differently coloured inks. (I don't recall exactly what was in this original purple notebook, but I'd guess only a few entries have survived to the latest "editions"). As chronicled on this blog, the modern incarnations of this document have been a little purple notebook, then a blue notebook, then a golden notebook....the latest notebook is shiny red. I have decided that there is no definitive version of my purple notebook. When I put together a new version, I add some new entries and drop some old entries-- sometimes I revive old entries that had been dropped. My current version is the one I find most inspiring at this stage of my life. Well, I did eventually write a novel about an order of 'Bards'-- The Bard's Apprentice, which I serialized on this blog, and which accumulated a modest readership at the time. It's the most (artistically) successful of the novels I've written-- the closest thing to a real novel! However, I didn't use the idea of the Ancaneron. The name itself was conjured out of thin air, intended to sound similar to the Decameron of Boccaccio (which I haven't read), the Mabinogion of Welsh mythology, or the Necronomicon of H.P. Lovecraft (another fictional text). It was supposed to suggest "ancient incantation". But let me return to the Ancaneron-- not the fictional Ancaneron, but the real one, the progenitor of the purple notebook. 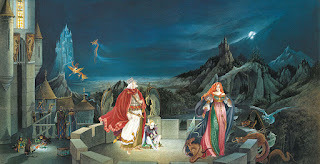 Even when I was a teenager, I very consciously thought of the Ancaneron as a "body of folklore" similar to the works of Homer, or the Arthurian legends, or the Mabinogion, or the Kalevala, or indeed the Bible. Like Billy Fisher in Billy Liar, I had my own country, except the country was me. My life was its history, and the Ancaneron was its national epic, or Scripture, or folklore, or some hodge-podge of all these things. And this analogy still makes sense to me. Writing out my new edition of the purple notebook, I found myself once again musing on canon formation, a life-long fascination. I tried to express it in this blog post, one of the posts that mean the most to me. Canon formation fascinates me in all its forms. Whether it is the canon formation of Scripture itself, or the evolution of an epic cycle or a folk tale or an urban legend, or the process whereby a poem or a song or a movie comes to be considered a "classic", there is something mysterious about it. At the most exalted heights, this is the mystery of the Holy Spirit forming the canon of Scripture from the choices of the ancient Hebrews and the early Christians. But, even when we descend from those heights, a certain mysteriousness remains. Who decided Casablanca was a classic movie? When did The Lord of the Rings pass from being a fad to an institution? You can't watch this happening; nobody can control it; it would be impossible even to reconstruct retrospectively. It just happens, on the dark side of the moon. It delights my Counter-Enlightenment heart. Well, my purple notebook has the same mysteriousness, on a micro level. The "spots of time" it chronicles just happened-- whether they are experiences or ideas. At a certain point, I realized that some memory or idea inspired me in a way that was especially potent. It kept coming back, just as "classic" songs or poems or films keep coming back (or classic plays "command the stage"). And, as I'm writing a new edition, I realize that some entries have ceased to "glow" while others have not. For instance, a memory of attending a Marc Chagall exhibition in Geneva, with Michelle, has continued to "glow", while the memory of reading the Foundation series of science-fiction novels by Isaac Asimov, in my teens, no longer "glows". (But perhaps it will glow again.) The dedication of a book of humorous essays, "For anyone, anywhere, with whom I have ever shared a laugh", continues to glow, while the memory of reading The Iliad when I was seventeen has ceased to glow-- for the moment. Does anyone find such matters interesting, other than me? Now that I have written so much, I find myself lacking a conclusion. Well, to anyone who cares, the purple notebook lives on! Look what I got in the mail today from a very generous reader! My favourite thing in the world....a snow globe! And a birthday card, and more! I was both delighted and taken aback at this very generous gift. Thank you! As I'd admitted, I was a little bit melancholy about my approaching fortieth birthday, for various reasons. But a lot of kind gestures from various people made it a nice experience, overall. My reader sent me a very sweet letter in which he said: "It's fair to contribute something". It's very kind, but there's no need! A few readers have sent me gifts over the years...The kindness is most appreciated, but I enjoy writing this blog as much as anyone enjoys reading it. Just having readers is ample reward-- and prayers, when I've asked for them. I pray for you, too. So thank you, friend, and thanks everybody for reading, and praying for me.